H. Rick Bamman - hbamman@shawmedia.com Police investigate the crash involving a car and a semi-truck on Rt. 120 at Glenwood Ave. west of Lakemoor on Monday. H. Rick Bamman - hbamman@shawmedia.com Police investigate the crash involving a car and a semi-trailer on Rt. 120 at Glenwood Ave. west of Lakemoor on Monday. Route 120 was closed for several hours between Lily Lake and Chapel Hill roads. 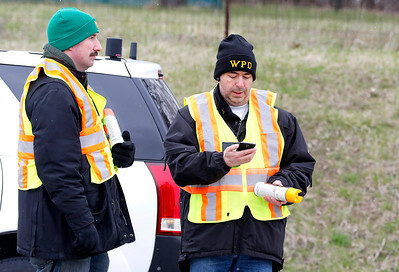 First responders found the car had crashed into the rear tires of a semi-trailer. The man who had been driving the vehicle was ejected from the vehicle and was lying on the pavement seriously injured. It appeared the car had been traveling east and the semi-trailer was traveling west. 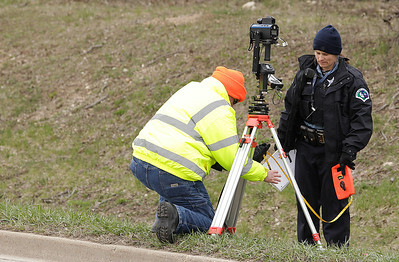 H. Rick Bamman - hbamman@shawmedia.com Police begin to take measurements as they investigate a crash involving a car and a semi-trailer on Rt. 120 at Glenwood Ave. west of Lakemoor on Monday. 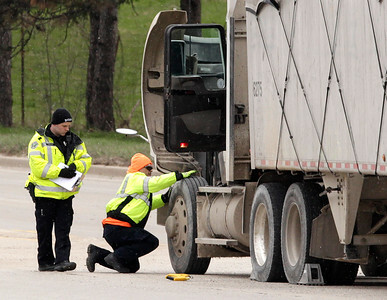 H. Rick Bamman - hbamman@shawmedia.com Police inspect the semi-trailer as they investigate a crash involving a car on Rt. 120 at Glenwood Ave. west of Lakemoor on Monday. The driver of the semi-trailer was uninjured and refused care. H. Rick Bamman - hbamman@shawmedia.com Police investigate the crash involving a car and a semi-trailer on Rt. 120 at Glenwood Ave. west of Lakemoor on Monday. A 26-year-old man was airlifted to Advocate Condell Medical Center in Libertyville with serious injuries from the crash, a fire official said. H. Rick Bamman - hbamman@shawmedia.com Police investigate the crash involving a car and a semi-trailer on Rt. 120 at Glenwood Ave. west of Lakemoor on Monday. Route 120 is closed between Lily Lake and Chapel Hill roads. One person was ejected from the vehicle and flown to a hospital. Police investigate the crash involving a car and a semi-trailer on Rt. 120 at Glenwood Ave. west of Lakemoor on Monday. Route 120 is closed between Lily Lake and Chapel Hill roads. One person was ejected from the vehicle and flown to a hospital.